Stunning, unusual house in sculptor's hillside medieval hamlet. Self catering house with unique atmosphere . Sleeps 2 on a per night basis. This Tuscan stone house was originally the private guest house of Fiore, the sculptor who restored the medieval hamlet of Peralta. On two floors, with a large, private terrace. She restored and furnished it with imagination, using the original terracotta roof tiles for the floor of the main room which has a sunken fireplace and large windows from which to enjoy the panoramic view. Also on the ground floor is a large kitchen, WC. Upstairs is the charming bedroom furnished with antiques - French windows give the same stunning view as the lower floor. Bathroom & dressing room are ensuite. Fiore's sculpture is all over the house and terrace giving tremendous character and atmosphere. Ideal location for a romantic holiday for two, but equally suitable for a group of friends with the possibility of taking additional bedrooms with ensuite bathrooms & their own entrances elsewhere in Peralta. This romantic and unusual self catering house is let by the night. The pool is shared. The hamlet of Peralta: The beautiful peaceful hamlet of Peralta has a spectacular setting in the Tuscan hills that rise high above the valley of Camaiore. It was restored with great love and imagination by international sculptor Fiore de Henriquez. She created a place that is quite unique. Peralta was her home up to her death in June 2004, and one can see her work all through the hamlet. Her sculpture everywhere, and the manner in which she restored and designed the hamlet give it very special atmosphere and character. With stunning, panoramic views over the valley to the hills and sea beyond and surrounded by terraces of olive groves, its stone walls covered with purple bougainvilleas, lemon trees, jasmine, Peralta seems like paradise., a place for people seeking tranquility and beauty. There is a swimming pool on an upper terrace with a panoramic view towards the sea. The large terrace in front of Peralta is a lovely place to sit with a glass of wine, enjoy the sunsets and meet other guests. ACCESS: Airports: Pisa 45 mins - Florence 1 hr. Genoa 1 hr.40mins - Bologna 2hrs. The exit from A11 and A12 motorway (Florence/Livorno/Genoa) is Viareggio/Camaiore. This is approx. 25 minutes from Peralta. Details given on our website. Note: The last 200 or so yards of our road are very steep and narrow with 2 hairpin bends. A smallish car is recommended, although an Espace & other large cars can make it!! This last bit of road is unsuitable for nervous drivers. The road comes to an end in our carpark. From there you walk to Peralta itself (about 200 yards/meters) and we can help with luggage (9am to 6pm). . Don't be put off by the last piece of road - Peralta more than merits the effort! And if you are in a very large car, you can always park it below the hairpin bends. Only a short walk up to the carpark. International sculptor Fiore de Henriquez was living in the area of Camaiore from the 1960's due to its proximity to the Carrara marble quarries and the bronze foundries of nearby Pietrasanta. In the 1970's she found the small hamlet of Peralta, perched on the hillside above Camaiore. It was remote, served only by a footpath, and the buildings were mainly in ruins - their inhabitants having left in the mid 1950's due to the hard living in the hills. No water nor electricity at this time. Fiore fell in love with the hamlet and managed to gradually buy the various houses. She then set about restoring them and the hamlet and created the very unique place that exists today. She died in 2004 and the hamlet was then taken over by a very good friend of her's who is the current owner. . Repairs and renovations are undertaken where necessary, but the essential essence of the hamlet remains the same as when Fiore was alive. It is the home of her archive and sculptures, which can be seen throughout the grounds and in the various accommodation, of which Casa Nuova is one. We normally let this house for a minimum of 2 nights (3 nights July & August) on a self-catering basis. We are very happy to stock the apartment with provisions (especially breakfast can be useful) for your arrival. We have a local cook who is happy to prepare meals to be warmed up in your house. A sort of 'take away' system. We have a list of possible dishes and she just needs to know the previous day. This is very popular with our guests who love to return from a day's sightseeing to find dinner ready on the cooker, just waiting to be heated up. Cheaper and not the bother of going out to a restaurant - and no cooking!! A particularly good idea for your first evening. Please ask for our menu.. However, there are many good inexpensive restaurants nearby - we leave a list in the house. Closest restaurant is a friendly pizzeria in Pieve, owned by Salvatore who speaks some English - walkable distance and Salvatore will drive you back to Peralta if he is not too busy. My husband and I have spent a month at Peralta every summer for 10 years, and we will be there again this year. We love its peaceful serenity. The path to Casa Nuova from the car park is a pleasure in itself. It's filled with birdsong and cicadas, and lined with sweet-smelling jasmine, fig trees, and bougainvillea. Casa Nuova, where we always stay, is ideal for us, with its large, wisteria-covered terrazza and its spectacular view of the valley below and, on clear days, the Mediterranean Sea. Peralta was once home to sculptor Fiore Hendriquez, and her sculptures keep the artistic spirit of the place alive. All of the stone houses at Peralta are comfortably furnished with rustic antiques and have private terraces and beautiful views of the valley. The hike up stone steps takes you to the swimming pool and an even more expansive view. Dinah Voisin, the owner, and Kate Simova, Peralta's manager, are a delight and extremely helpful and accommodating in making sure that your stay is everything you want it to be. We have just returned from staying at Casa Nuova at Peralta for 6 nights. It is all that the other positive reviews and the web site description says it is. It feels very rustic but with modern fittings and it is is furnished and kitted out more like a home than a rental property. We loved the antique furniture, quality bedlinen, sculptures, and paintings. It was very peaceful despite being full and the staff are there and helpful if you need them but don't bother you if you are self sufficient. The only challenge - which is part of its appeal is the last 100 metres of the road up to Peralta.We had a largish low suspension car which only just made it around the hairpin, steep and narrow bends - though you can park lower down and walk up. The swimming pool is located in a fantastic position but is too small for serious swimmers. Peralta is truly a one off very memorable experience. This place is fab, quite as good as it looks. I rented Casa Nuova for a week in June. Though it's only a one bedroom house it feels very spacious. Huge pergola. Stunning views across the valley all the way to the Med from all rooms. Peace and quiet..Probably the most private feeling house in the village. Visitors should be ready for the very precipitous road up to the village - but you soon get used to it. The communal bar area is lovely in the evening and has even better views. Staff very friendly, make you feel like an honoured guest. Good shops in nearby Camaiore, nice little pizzeria in Prado di Sotto (15 min walk). Pietrasanta a lovely town. A car a necessity. This was the 6th time I've been to Peralta so I more or less knew what the deal would be... fantastic as always. However, I never stayed at Casa Nuova. This year I decided to book the house for our honeymoon and what a treat it was. Even after coming here for a few years now, this place managed to amaze me. It's very spacious and all the necessary accomodations are in place. The athmosphere is very special and the view from the private terrace is stunning. It's also an excellent place to have a nice honeymoon barbeque :) ! If you want something special and relaxing, this is the place! Thank you for your appreciation of Casa Nuova. It is such a special house - mainly because Fiore would use it as her personal guest house and so put a lot of her sculpture in it, also books, antique furniture etc. She also restored it in such an unusual and interesting way. Glad you enjoyed it! Peralta is an amazing place. It's a unique experience and it's hard to describe. From the moment you walk in along the path through the olive groves you feel as if you've entered another world away from the pressures of everyday life. On our first visit there we would sit on the terrace in front of the bar (uniquely, in this day and age, you help yourself to what ever you want from the bar and write it down in a little book and you pay at the end of your stay!) and we would see the look of delight on the faces of newly arrived guests as they took in the view. 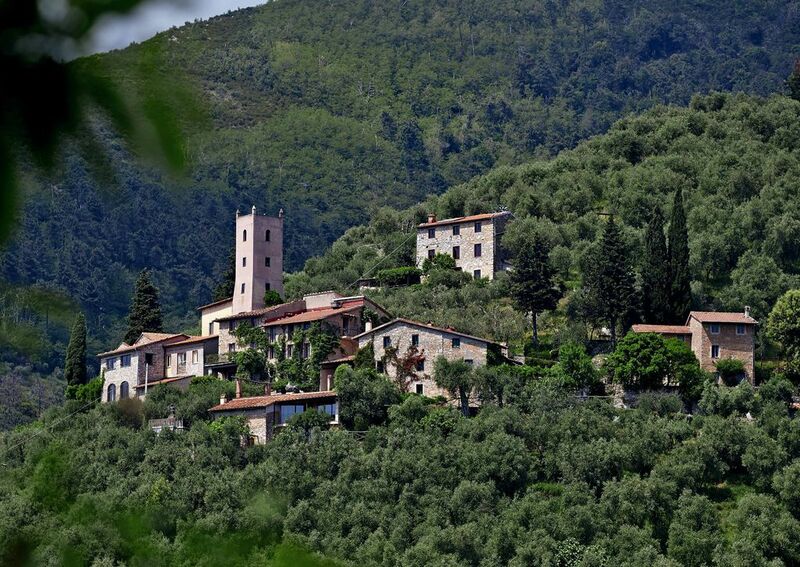 On various visits we have stayed in Pipistrelli, Gemelli and Casa Nuova all with their own unique character. All nicely furnished and comfortable. The team that manages Peralta are lovely. Because they worked for the artist that restored it, until she died a few years ago, they are very concerned with keeping the unique flavor of the place. We would (and do!) recommend Peralta to anyone who is seeking a restful and quiet vacation away from the stresses of modern day life.